There are actually a lot of pretty cool things you could do with the Facebook chat window. I bet you already know that. But, here is one cool thing I discovered today. It was actually shared to me by a friend. I'm not really a Facebook expert and this trick might be pretty old. But, whatever. I just think it's cool! Why don't you spam your friends with this PSY emoticon instead of asking them to 'Like' your pictures? 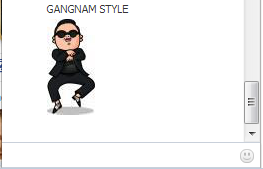 Paste it on any Facebook chat window available. Ta da! There you go. Cue in "Gangnam Style" music! What are you waiting for? Go ahead, impress your friends and enjoy!